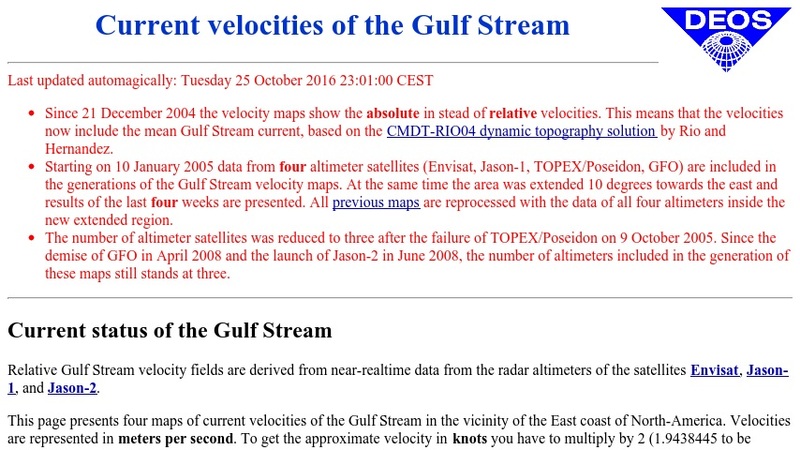 This site presents near-realtime monitoring of the current system of the Gulf Stream with ERS-2 fast delivery altimeter data from four satellites--Envisat, Jason-1, TOPEX/Poseidon, and GFO--and DUT operational orbits. Four constantly updated maps are presented,showing current velocities of the Gulf Stream in the vicinity of the East Coast of North America one week before date of viewing, two weeks before, three weeks before, and four weeks before. Animations of the Gulf Stream velocities are also available from the site, as well as an archive of previous maps.